This tutorial was written by me on March 31st, 2015. Any resemblance to any other tutorials is purely coincidental! You may not copy/paste any part of my tuts elsewhere, but you may text link to them for challenges etc! 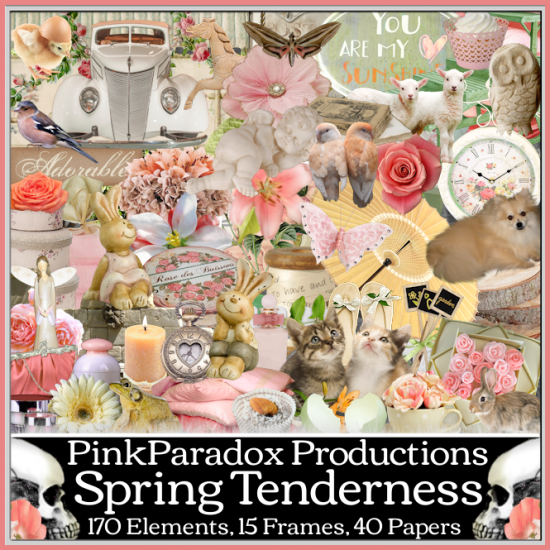 **New CT Tag** Scrap Kit of choice, I am using a PTU Scrapkit called *Spring Tenderness* By Pink Paradox Productions. You can find this kit and many other beautiful kits here. 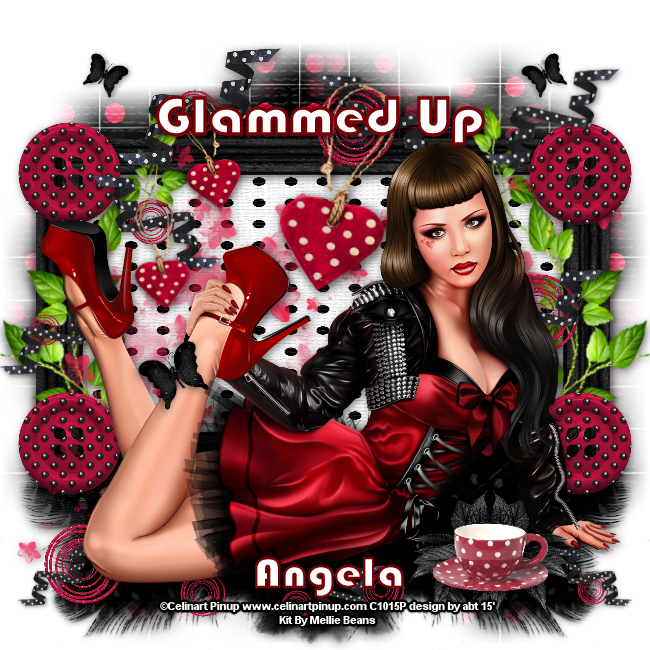 you can find this gorgeous tube here. Copy & Paste to canvas. Resize and Position to center of your work. Copy & Paste to bottom layer. Resize & Position add to the center of your work and behind tube. Copy& Paste to layer just below tube. Resize & Position add to the upper left side of your bottom element. Copy & Paste to layer just below tube. Resize & Position to the bottom left corner of the very bottom element. Copy & Paste to top layer. Resize & Position add to the left side of your tube and add to the top of your books. Copy & Paste to layer just above bottom layer. Resize & Position add to the left side and place to center back of your other layers. Copy & Paste to layer just below tube. Resize & Position add to right side of your tube and place on the bottom corner of your bottom layer. Copy & Paste to top layer. Resize & Position add to the right side down toward bottom right in front of our last element. Copy & Paste to layer just above tube. Resize & Position add to center bottom of your tube as I have done. Copy & Paste to layer just above you tube. Resize & Position add to the center bottom of your last layer then rotate as I have done. Copy & Paste to layer just above bottom layer. Resize & Position add to the right side of your work and place like mine. Then you will need to flip by pressing ctrl+M. Copy & Paste to bottom layer. Resize & Position add to the center of your work you might want to go down to fit so that the grass is under the bottom. Copy & Paste to layer just above bottom layer. Resize & Position add to the bottom center as if the flowers are part of the grass. Copy & Paste to layer above Spring Tenderness (56). Resize & Position add to the right side toward the center top. Arrange to your likes. Copy & Paste to layer just above Spring Tenderness (56). Resize & Position add to left side to top center of layer under as I have done. Copy & Paste to top layer. Resize & Position add to left side and add where I have done or where you would like. Resize & Position to fit your canvas. Add mask of your choice. To finish add any other details and your copyright. Make sure to save your work then you are finished. Hope this was easy and fun to follow! This tutorial was written by me on March 29th, 2015. Any resemblance to any other tutorials is purely coincidental! You may not copy/paste any part of my tuts elsewhere, but you may text link to them for challenges etc! 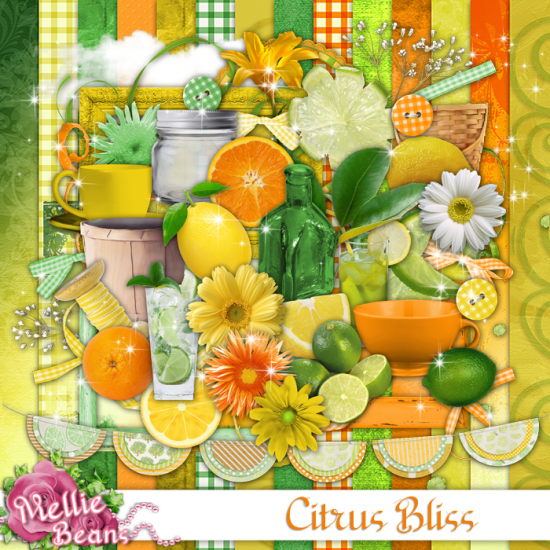 **New CT Tag** Scrap Kit of choice, I am using a PTU Scrapkit called *Sticky Sweet* By Pink Paradox Productions. You can find this gorgeous kit here. Copy& Paste to top layer. Resize & Position add to the bottom right corner as I have done. Copy & Paste to layer just above tube. Resize & Position add to the center toward the bottom of your tube where the we placed last element. Blend in as I have done. Then erase the bottom part of your tube up to this element so you do not see her legs. Copy & Paste to layer just below tube. Resize & Position add to the left side of your tube and add as I have done. If you want you can rotate. Copy & Paste to top layer. Resize & Position add to the left side and place you the branch as if the bird is sitting on it. Copy & Paste to top layer. Resize & Position add to right side of your tube and place on the watering can or where you like. Copy & Paste to layer just below bird. Resize & Position add to the left side down toward bottom. Then flip by pressing ctrl+M. Copy & Paste to layer below hat. Resize & Position add to center bottom just next the the hat as I have done. Copy & Paste to layer just above your bottom layer. Resize & Position add to the center and blind in behind your tube. Copy & Paste to layer just behind bottom layer. Resize & Position add to the bottom center of your work and resize so you can see the pink part of the element. Then duplicate it to make darker. Copy & Paste to layer just above Sticky Sweet (166). Resize & Position add to the bottom right side corner to blend in with your work. Copy & Paste to layer just above bottom layer. Resize & Position add to the right upper side of your work and mirror this by pressing ctrl+B. Copy & Paste to top layer. Resize & Position add to the right side down toward the bottom of your work. Blend your tea cup in with the smile layer. Copy & Paste to layer just below your pink hat layer. Resize & Position add to left side right next to your hat and rotate as I have done. This tutorial was written by me on March 28th, 2015. Any resemblance to any other tutorials is purely coincidental! You may not copy/paste any part of my tuts elsewhere, but you may text link to them for challenges etc! Tube or Image of choice, I am using a PTU Tube *Elis* By ©Lightartist_XXX can be found here. Program Used: Paint Shop Pro X7 but any PSP should work. Copy & Paste Resize & Position to center toward bottom of canvas. Copy &Paste to bottom layer. Resize & Position add to center up behind your tube as I have done. Copy & Paste to top layer. Resize & Position add to top part of your fence layer. Copy & Paste to layer just below tube. Resize & Position add to fit up against the bottom of fence layer. Copy & Paste to layer just below tube. Resize & Position add to center just in front of eggs and blend in between tube and eggs. Copy & Paste to top layer. Resize & Position add to right side and place on your tubes arm. Copy & Paste to layer just above bottom fence layer. Resize & Position add to center bottom of fence and blend in behind your other eggs. Copy & Paste to layer just above bottom layer. Resize & Position add to either side of fence layer and place on the grass as I have done. Copy & Paste to layer just above bottom layer. Resize & Position add to right side and blend in with the grass of your bottom layer. (Duplicate) then flip your copy by pressing ctrl+M. Copy & Paste to layer just above ce106. Resize & Position add to right side and blend in with ce106. (Duplicate) move your copy to the left side of your work area and put up behind your big egg. Copy & Paste to layer just above bottom layer. Resize & Position add to left side of your work and place just behind your ce103 and big egg as I have done. Copy & Paste to layer just below tube. Resize & Position add to right side and place in front of your flower layers. Copy& Paste to layer jut above bottom layer. Resize & Position add to center and place toward the bottom of your fence and blend in behind your other elements. (Duplicate) then press ctrl+B and add to match you can arrange if you wish too. Copy & Paste to bottom layer. Resize & Position add to top center so it looks like it is behind the fence. This tutorial was written by me on March 27th, 2015. Any resemblance to any other tutorials is purely coincidental! You may not copy/paste any part of my tuts elsewhere, but you may text link to them for challenges etc! Tube or Image of choice, I am using a PTU Tube *Easter Girl 3* By ©Alex_Prihodko can be found here. Program Used: Paint Shop Pro X6 but any PSP should work. Copy & Paste Resize & Position to center of canvas. Copy &Paste to bottom layer. Resize & Position add to the bottom and place in the middle. Then we are going to flip the frame by pressing ctrl+M. Move your tube to look as if she is sitting in the frame bottom. Copy & Paste to layer just above frame. Resize & Position add to the right bottom corner of your frame. Copy & Paste to layer just below tube. Resize & Position add to the right bottom of your frame and place it on the top part of your basket and make it look as if it is sitting on the eggs. Copy & Paste to layer just above frame. Resize & Position add to bottom center so it looks like grass under your work. Then flip by pressing ctrl+M. Copy & Paste to layer just above frame. Resize & Position add to top right corner of your frame. Copy & Paste to layer just above frame. Resize & Poissition add to the top right corner of your frame and arrange behind your last flower element. Then duplicate and flip by pressing ctrl+M and move to other side of flower to match. Copy & Paste to layer just below your grass. Resize & Position add to upper right corner of your frame and place in front middle of your flowers. Copy & Paste to layer just below your lamb. Resize & Position add to just above your lamb. Copy & Paste to layer just under your tube. Resize & Position to bottom right and make sure that you resize it so you can fit 2 more across your bottom. (Duplicate) then press ctrl+B to add to other side. Then duplicate and add to front center. Copy & Paste to layer just above frame. Resize & Position add to left side right behind your tube. (Duplicate) then add to other side by pressing ctrl+B. Copy& Paste to top layer. Resize & Position to bottom and place so it look as if your chick is standing on one of the egg shells. Then you can flip as I have done by pressing ctrl+M. Copy& Paste to layer just below your Happy Easter element. Resize & Position add to right side behind your basket. Flip by pressing ctrl+M. Copy& Paste to layer just below your tube. Resize & Position add right behind your tube layer. Then duplicate and press ctrl+B to add to the other side. With the copy you will need to move down a few layers. You can purchase her kits from here. Tube or Image of choice, I am using a PTU Tube *Red* By ©Spazzd Art can be found here. Copy & Paste to center of your canvas. Resize to what you like. Copy &Paste to bottom layer. Resize & Position add toward the bottom and center of your tube. Rotate your frame if you wish as I have done. Copy & Paste to layer just below your tube. Resize & Position add to bottom left corner of your frame. (Duplicate) and add to other side of your work by pressing ctrl+B. Next we will need to flip both copies by pressing ctrl+M. Copy & Paste to layer just below your tube. Resize & Position add to right side and center to fit inside frame. Copy & Paste to layer just above e13. Resize & Position add to right side bottom corner of frame. Copy & Paste to top layer. Resize & Position add to right side bottom and place in front of your clock and arrange to your taste. Copy & Paste to top layer. Resize & Position to fit the center bottom of your work. Copy & Paste to top layer. Resize & Position add to the center of the candles we just added and place where you wish. Copy & Paste to layer just above frame. Resize & Position add to left bottom corner of frame and place as your wish or as I did. Copy & Paste to layer just above frame. Resize & Position add to upper left side corner of frame and arrange as you wish. (Duplicate) then we are going to press ctrl+B to add to other side. Copy & Paste to top layer. Resize & Position add to top of your work and place where you wish. (Duplicate) if you like and add and resize it is all up to you. Copy & Paste to layer just above e40. Resize & Position add behind your tube and so that it is over the book layer. Copy & Paste to top layer. Resize & Position add to left side bottom corner to blend in with you book. Copy & Paste to bottom layer. Resize & Position to fit bottom to fit frame. Then go up to Effects and pull down to plugins. In Plugins go to KPT Collection then select KPT Ink Dropper. Once you are in KPT Ink Dropper you will use white and click in your box to add the white to the back ground. Have fun. Copy & Paste to your paper behind frame. Resize & Position add where you wish. Then duplicate it and add to other side by pressing ctrl+B. Then if you want them darker as I have done you will just have to select each and duplicate them. Kit and Tube sold separately. This tutorial was written by me on March 26th, 2015. Any resemblance to any other tutorials is purely coincidental! You may not copy/paste any part of my tuts elsewhere, but you may text link to them for challenges etc! You can find this amazing tube here. Copy & Paste . Resize & Position add to center of your canvas. Copy & Paste to bottom layer. Resize & Position add to the center more toward the top of your work area. Copy& Paste to layer just below tube. Resize & Position add to bottom center of work area. It should look as if the grass is right under your tube. Copy & Paste to layer just under your tube. Resize & Position add to center right behind tube so it will blend in with your frame and grass. Copy & Paste to layer just behind your tube.. Resize & Position add to right side of your tube and place toward the center so it will blend in with the other elements. Copy & Paste to top layer. Resize & Position add to the left side of your work area and tube. Adjust and try to blend in with your other elements. Copy & Paste to very bottom layer. Resize & Position add the the center of your work. Copy & Paste to layer just above frame. Resize & Position add to the center of your work right behind tube. Copy & Paste to layer two below your tube. Resize & Position add to the back center of your tube. 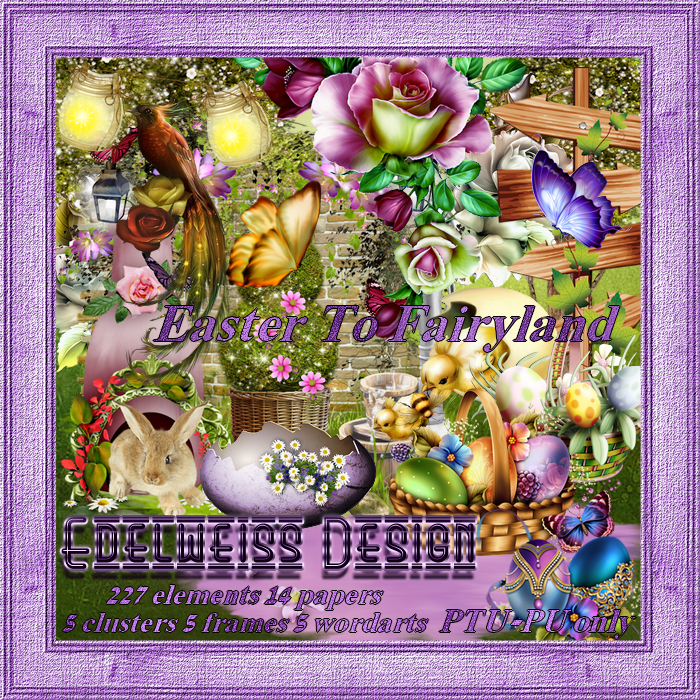 Copy & Paste to layer just below Easter_of_Fairyland_128. Resize & Position add to left center of your work and blend in with the other elements. Copy & Paste to top layer. Resize & Position add to front bottom on your grass. Copy & Paste to top layer. Resize & Position add to left side and blend it in right up to your eggshell element. Flip your little chicks by pressing ctrl+M. Copy & Paste to top layer. Resize & Position add to right side of your work and place in front of your bucket element. Copy & Paste to layer just above your brick wall. Resize & Position add to right side of your work and place behind so it looks hidden and it blends in with your grass and flowers. Copy & Paste to layer just above your frame. Resize & Position add to top of your frame and center it just behind your tube. Copy & Paste to layer just below frame. Resize & Position add paper to your taste. Then select frame layer. Go over and select your wand tool. With your wand click the inside of your frame. You should see matching ants. Next go up to Selections-down to modify-over to extend- set to 13. Then select your paper layer again and go over and get your pointer tool and click inside the frame. Next you will need to go over and delete your first paper layer. This tutorial was written by me on March 25th, 2015. Any resemblance to any other tutorials is purely coincidental! You may not copy/paste any part of my tuts elsewhere, but you may text link to them for challenges etc! 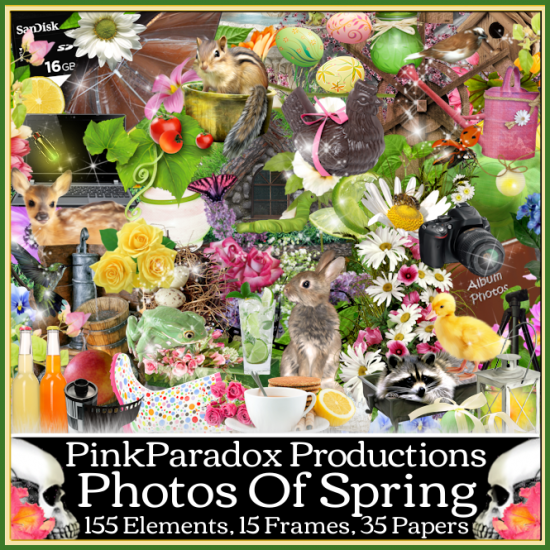 **New CT Tag** Scrap Kit of choice, I am using a PTU Scrapkit called *Photos Of Spring* By Pink Paradox Productions. Copy & Paste to bottom layer. Resize & Position add to the left side behind your tube. Copy& Paste to bottom layer. Resize & Position to the left side behind you last element added and rotate if you desire. Copy & Paste to bottom layer. Resize & Position add to the left side toward the bottom of your last two elements. Copy & Paste to layer just below tube. Resize & Position add to the bottom part of your work and center it behind your tube. Copy & Paste to top layer. Resize & Position add to the bottom part of your work and your tube. Place it where you would like. Flip by pressing ctrl+M. Copy & Paste to layer just above your tube. Resize & Position add to fit behind your last action and place off to the right side. Copy & Paste to layer just below tube. Resize & Position add to the right side just behind the tube. Then flip by pressing ctrl+M. Copy & Paste to layer below Photos Of Spring (63). Resize & Position add to fit behind and then select your eraser tool and erase paper that is outside of your film strip layer. Copy & Paste to bottom layer. Resize & Position add to the right side toward the upper part behind your tube. Then flip the element by pressing ctrl+M. Copy & Paste to layer behind Photos Of Spring (68). Resize & Position add behind your Photos Of Spring (68) and blend in. Copy & Paste to layer just above Photos Of Spring (72). Resize & Position add to the right upper side of your work and flip by pressing ctrl+M. Arrange and place as you wish. Copy& Paste to layer just below Photos Of Spring (114). Resize & Position add to the upper center of your work and blend in with your other elements. Copy & Paste to bottom layer. Resize & Position add to upper right side and make it blend in the back of your elements. Copy & Paste to layer just above Photos Of Spring (151). Resize & Position add to upper right side and make it blend in the back of your elements. Copy & Paste to layer just above Photos Of Spring (72). Resize & Position add to upper center and blend in with your flower elements and rotate. Copy & Paste to layer just behind top layer. Resize & Position add to blend in with your bottles and cup elements. Copy & Paste to top layer. Resize & Position add to right upper corner. 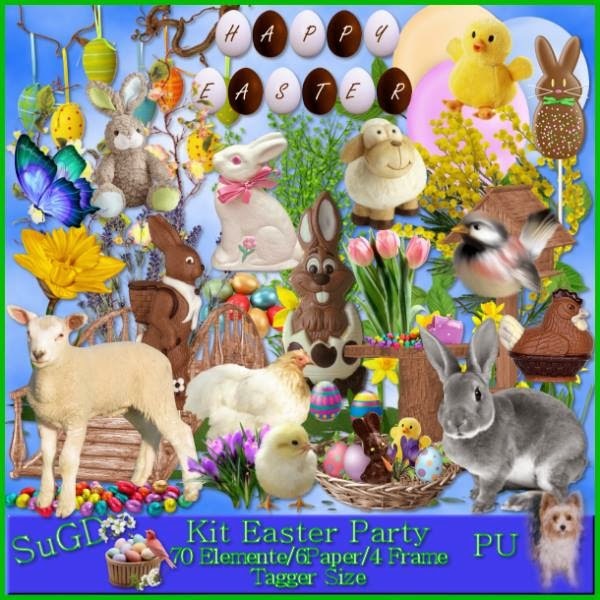 Tube or Image of choice, I am using a PTU Tube *Kittie* By ©Spazzd Art can be found here. Copy & Paste to center of your canvas. Copy &Paste to bottom layer. Resize & Position center of your canvas. Tube be on top and center in the e12. Then flip your tube by pressing ctrl+M. Copy & Paste to top layer. Resize & Position to bottom center of your tube as I have done. Duplicate and then flip the copy by pressing ctrl+M. Then select your tube and go over and get you eraser tool and erase the tube that runs under and you see in this element. Copy & Paste to layer just below tube layer. Resize & Position to fit behind your tube then rotate as I have done or to your liking. Copy & Paste to layer just above frame. Resize & Position to left side of your tube and place to fit your frame. Copy & Paste to top layer. Resize & Position to right side on top of e08 and resize to fit from right side to the middle of e08. Duplicate and we are going to mirror image the copy by pressing ctrl+B. Copy & Paste to layer just above your frame. Resize & Position to fit the center of your work. Copy & Paste to layer just below tube. Resize & Position to right side of your tube and center of your frame. Copy & Paste to layer just above clock. Resize & Position to fit under the clock and arrange as you wish. Copy & Paste to layer just below clock. Resize & Position to fit under the clock and e37 and arrange as you wish. Copy & Paste to top layer. Resize & Position add to top of frame just behind your elements under the clock. (Duplicate) to make darker if you wish. Copy & Paste to top layer. Resize & Position add to left side of your tube and add where you would like. (Duplicate) then flip by pressing ctrl+M and resize. Copy & Paste to top layer. Resize & Position add to right side of your work and add and arrange to your liking. Copy & Paste to bottom layer. Resize & Position to fit bottom to fit frame. This tutorial was written by me on March 24th, 2015. Any resemblance to any other tutorials is purely coincidental! You may not copy/paste any part of my tuts elsewhere, but you may text link to them for challenges etc! You can purchase her kits from here and here. 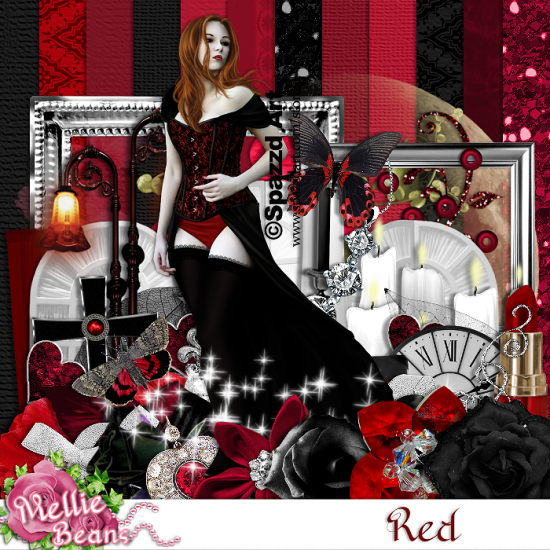 Tube or Image of choice, I am using a PTU Tube *Christelle Rockabilly* By © Celinart Pinups can be found here. Copy & Paste to center more toward the bottom of your canvas. Copy &Paste to bottom layer. Resize & Position center of your canvas. Tube should fit your frame and be below your frame as I have mine. Copy & Paste to layer just below your tube. Resize & Position one of your corner on frame. Then made 3 copies and add to each corner. Copy & Paste to layer just above tube layer. Resize & Position to fit behind your cup. Then duplicate and flip it by pressing ctrl+M. Copy & Paste to layer just above frame. Resize & Position to center of frame and add to where you wish. Copy & Paste to layer just below your tube. Resize & Position to anywhere on your work and copy and resize as much as you like. more and arrange as I have or as you wish. Copy & Paste to layer just below tube. Resize & Position to fit down under your tube off to either side. Then duplicate 5 times. One will stay with your original and 2 will be moved to other side by pressing ctrl+B. Next move other copies as you wish and rotate and resize if you wish. Copy & Paste to layer just above frame. Resize & Position to as you wish and copy as many as you wish and resize them as you desire or flip by pressing ctrl+M. Copy & Paste to layer just above frame. Resize & Position to right side of your frame and resize until it fit you work. (Duplicate) and press ctrl+B to add to other side. Copy & Paste to top layer. Resize & Position add to top of frame and add where you wish. (Duplicate) move copy to a different area on your work. Then flip it by pressing ctrl+M. Copy & Paste to bottom layer. Resize & Position to fit inside your frame layer. This tutorial was written by me on March 23rd, 2015. Any resemblance to any other tutorials is purely coincidental! You may not copy/paste any part of my tuts elsewhere, but you may text link to them for challenges etc! 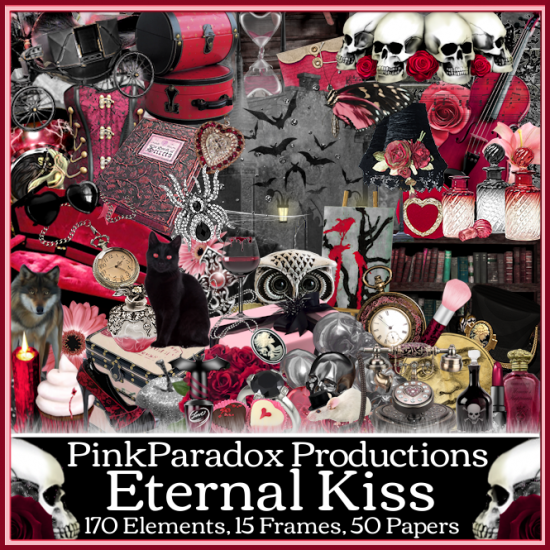 **New CT Tag** Scrap Kit of choice, I am using a PTU Scrapkit called *Eternal Kiss* By Pink Paradox Productions. You can find this kit and many other beautiful kits here . I used two different one in this tag. Copy & Paste to top layer. Resize & Position to the right side down toward the bottom of your tube layer. Copy& Paste to bottom layer. Resize & Position to center back of tube more toward the bottom. Copy & Paste to layer just below tube layer. Resize & Position to right side and blend in as you like. Then flip by pressing ctrl+M. Copy & Paste to bottom layer. Resize & Position to center behind your tube more to the top of your work. Copy & Paste to top layer. Resize & Position to bottom of your tube and adjust to your liking. Copy & Paste to layer just behind External Kiss (21). Resize & Position to fit to the left side bottom of tube. Copy & Paste to layer just above External Kiss (105). Resize & Position to upper center of your tube and bookshelf. Then (Duplicate) move or just a little and then (Duplicate) again and press ctrl+B to add to other side to match. Copy & Paste to layer just above External Kiss (105). Resize & Position to right top corner of bookshelf layer. (Duplicate) then press ctrl+B to add to the left side to match. You may have to move it some as I did. Copy & Paste to layer just blow tube layer. Resize & Position to right side just behind your tube. Once you get it where you like it on that side then (duplicate) and press ctrl+B to add to other side to match. Copy & Paste to very bottom layer. Resize & Position to top right side just behind bookshelf layer. Then duplicate and add to other side to match by pressing ctrl+B. Copy & Paste to top layer. Resize & Position to right top corner up by bookshelf. (Duplicate) then flip to other side by pressing ctrl+B. Copy & Paste to layer just above Eternal Kiss (95). Resize & Position to bottom left side and blend in behind your perfumes. Copy& Paste to top layer. Resize & Position to bottom left side in front or perfume bottles. Copy & Paste to top layer. Resize & Position to right corner bottom and flip by pressing ctrl+M. This tutorial was written by me on March 20th, 2015. Any resemblance to any other tutorials is purely coincidental! You may not copy/paste any part of my tuts elsewhere, but you may text link to them for challenges etc! 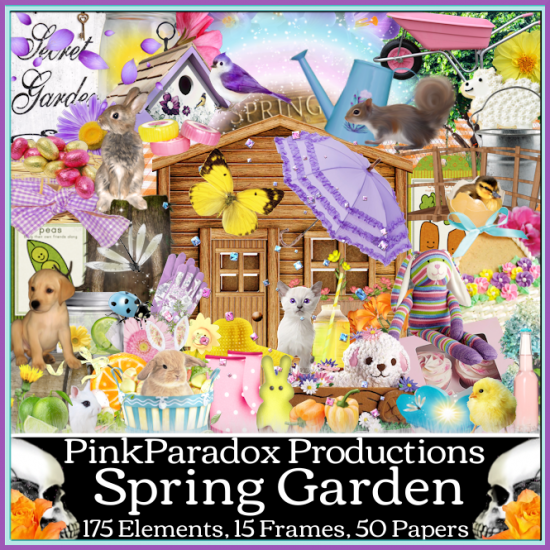 **New CT Tag** Scrap Kit of choice, I am using a PTU Scrapkit called *Spring Garden* By Pink Paradox Productions. Copy & Paste to bottom layer. Resize & Position to the right side and rotate as I have done and arrange to where you wish. Copy& Paste to top layer. Resize & Position to right side to bottom of your frame element. Copy & Paste to canvas. Resize and Position to left side of your work. (Duplicate) move your copy down to layer just below your grass layer Spring Garden (112). Then you will need to select your earser tool and select your top tube layer and erase what you do not want to blend it into your grass. Then you will need to select your bottom tube layer and do the same. Go back and copy your tube again copy and paste to the layer just behind your frame. We are going to flip our tube by pressing ctrl+M. Then we are going to make our tube size bigger. Once you have that done we are going to select out frame. Then we are going to go over and select out magic wand tool and once we have it then we need to click inside the frame and you should see marching ants. Once you see them go up and in Selections pull down to modify then over to expand and set it to 13. Next we need to select your tube layer again them make sure you have your pointer tool again and click inside your frame. Now you will need to go to your orignal tube layer and delete it. Then we are going to add a new paper behind our tube layer. I am using Spring Garden Paper (21) but feel free to you what you like. Then we are going to go back to our tube so make sure you have it selected. Go up to Effects and go down to Plugins over to Xero then select Radiance and set as you wish. Then we are going to go back to Xero and select Porcelain and set as you wish again. Then we are going to go up to Effect - Photo Effect - Infrared Film and set at 18, 35, 0. Then over in your layer pull down and select Luminance (L). Copy & Paste to layer just below Spring Garden (29). 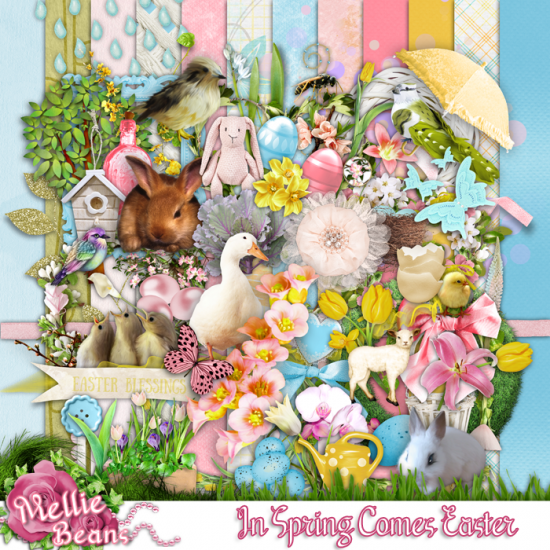 Resize & Position to blend in behind your bunny element. Copy & Paste to layer just above frame layer. Resize & Position to bottom of frame to blend in with the elements already there. Copy & Paste to top layer. Resize & Position to fit to the left side bottom of frame and blend in. Copy & Paste to bottom layer. Resize & Position to left side of your frame. Copy & Paste to layer just below Spring Garden (103). Resize & Position to center bottom of frame and element Spring Garden (103). Copy & Paste to layer just above frame layer. Resize & Position to top of frame. Copy & Paste to layer just above frame. Resize & Position to top left side and arrange to your liking. Copy & Paste to layer just below Spring Garden (150). Resize & Position to fit over and blend into your last flower layer just above. Copy & Paste to layer just above Spring Garden (150). Resize & Position to left side and blend in behind with your other flowers. (Duplicate) x2 and arrange as you wish if you would like to flip then just press ctrl+M. Copy& Paste to top layer. Resize & Position to top of the elements down at the bottom of your frame. (Duplicate) you can rotate and resize if you wish and add the copy up on the right side middle of frame or as you like. Copy & Paste to top layer. Resize & Position to right corner bottom by bunny bear element. This tutorial was written by me on March 19th, 2015. Any resemblance to any other tutorials is purely coincidental! You may not copy/paste any part of my tuts elsewhere, but you may text link to them for challenges etc! 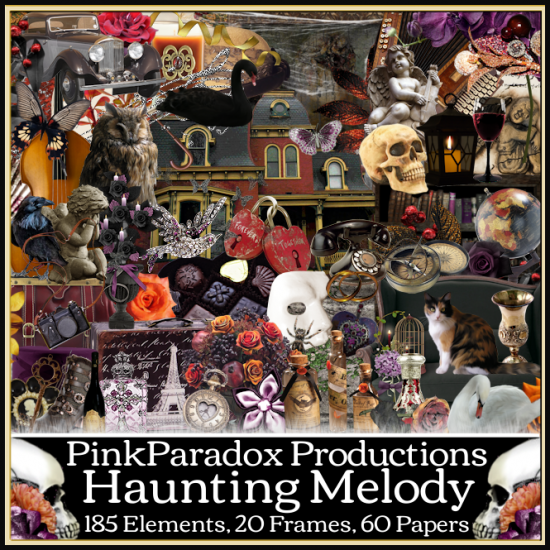 **New CT Tag** Scrap Kit of choice, I am using a PTU Scrapkit called *Haunting Melody* By Pink Paradox Productions. Copy & Paste to bottom layer. Resize & Position to the left of center and press ctlr+M to flip. Copy& Paste to top layer. Resize & Position to right side more to the bottom. Copy & Paste to canvas. Resize and Position to look as if she is sitting on the car or next to it is you have different tube. You will need to flip by pressing ctrl+M if you are using same tube as I am. Copy & Paste to layer just below Haunting Melody (115). Resize & Position to center of your bottom layer Haunting Melody (112). Copy & Paste to bottom layer. Resize & Position to bottom center of your work area. Car should look as if it is on this element. Copy & Paste to layer just above Haunting Melody (117). Resize & Position to fit behind sign more toward the bottom. Copy & Paste to bottom layer. Resize & Position to left side and blend in with element Haunting Melody (112). Copy & Paste to layer just below Haunting Melody (115). Resize & Position to left side to fit in with your sign and flowers. Copy & Paste to layer just above Haunting Melody (176). Resize & Position to center of Haunting Melody (176) and blend it in as you wish. Copy & Paste to top layer. Resize & Position to top over in your tree elements. I used my plugin called Eye Candy 4000 - Gradient Glow. Copy & Paste to layer just above Haunting Melody (112). Resize & Position to fit center of your work. Copy & Paste to layer just below Haunting Melody (190). Resize & Position to left side and blend in behind your angel element. (Duplicate) then press ctlr+M and rotate and blend on the other side of your sign element. Copy& Paste to top layer. Resize & Position to top of your sign element and then we are going to flip by pressing ctrl+M. Copy & Paste to top layer. Resize & Position to left upper next to word element. (Duplicate) resize and press ctrl+B and add to other side of word element. Copy & Paste to layer just below Haunting Melody (115). Resize & Position to the left side in front of your angel element. (Duplicate) and flip by pressing ctrl+M and resize and arrange to your liking. Copy & Paste to layer just below Haunting Melody (115). Resize & Position to left side by your sign and tube layers. This tutorial was written by me on March 18th, 2015. Any resemblance to any other tutorials is purely coincidental! You may not copy/paste any part of my tuts elsewhere, but you may text link to them for challenges etc! Copy & Paste Resize & Position to center of canvas. We will work with tube later. Copy &Paste to bottom layer. Resize & Position to bottom of your tube and center layer to tube. Copy & Paste to top layer. Resize & Position to right side to the bottom of grass on ouat32. Copy & Paste to top layer. Resize & Position to fit down in front of ouat29 then press ctrl+M to flip and blend. Copy & Paste to layer just below ouat29. Resize & Position to blend in between castle and sign then press ctrl+M to flip. (Duplicate) if you like. Copy & Paste to top layer.. Resize & Position to center bottom just in front of tube. Copy & Paste to layer just below ouat29. Resize & Position to right side and blend in to look as the element is on the sign. Copy & Paste to layer just above bottom layer. Resize & Position to left side and blend it in to look like it is up next to the castle as I have done. Copy & Paste to layer just above ouat51. Resize & Position to left side and blend in with the ouat51. Copy & Paste to layer just below ouat29. Resize & Position to right side and blend in with your elements as I have done. Copy & Paste to top layer. Resize & Position to right side and make it look as if sitting on top of the sign. Copy & Paste to layer just above ouat29. Resize & Position to upper part on either size of your work. (Duplicate) then press ctrl+B to add in same spot of the other side. Copy& Paste to bottom layer. Resize & Position to fit in upper center behind the castle. Copy & Paste to top layer. Resize & Position to left bottom corner of your grass. Used for (Once Upon A Time) as well. This tutorial was written by me on March 17th, 2015. Any resemblance to any other tutorials is purely coincidental! You may not copy/paste any part of my tuts elsewhere, but you may text link to them for challenges etc! Tube or Image of choice, I am using a PTU Tube *Abee* By © Misticheskaya can be found here. Plug-In - Zero used for tube. Copy &Paste to bottom layer. Resize & Position center of your canvas. (Duplicate) then press ctrl+M and resize smaller than other copy and arrange. Copy & Paste to layer just below your tube. Resize & Position to upper center of your tube with your clouds. Copy & Paste to layer below tube. Resize & Position to fit behind your tubes wing and resize and add where you wish. Then (Duplicate as many times as you wish). Copy & Paste to layer just above flowers 05. Resize & Position to blend in with your flower 05. (Duplicate) as you with and rotate and resize. Have fun. Copy & Paste to layer just below your tube. Resize & Position to left side and place as if she looks to be leaning up against it. Copy & Paste to layer just behind MarketBasket. Resize & Position to left side of your basket as I have done. Copy & Paste to layer just above Flower01. Resize & Poissition to fit right in fornt of Flower01 and blend it in as I have done. Copy & Paste to layer just above MarketBasket. Resize & Position to fit off to the left side of basket. Copy & Paste to layer just above Limes 01. Resize & Position to right side of your limes and blend it in with limes. Copy & Paste to layer just below tube. Resize & Position to right side and rotate your frame. Copy & Paste to layer just above frame layer. Resize & Position to one of the corners of your frame. Then you will need to duplicate 2 times. Add to each corner you are able to see. Copy & Paste to layer just above Flowers 04. Resize & Position to fit in the middle of each of your flowers 04. Copy & Paste to layer just above frame 02. Resize & Position to fit behind your bottom flowers on frame 02. Copy & Paste to layer just above your marketbasket. Resize & Position to fit on the center top of the basket. Copy & Paste to top layer. Resize & Position to blend in anywhere in your work area. Copy & Paste to layer just below frame 02. Resize & Position to your like then you will need to select your frame 02. Selet your wand tool and click inside frame. Make sure that you see marching ants if you do then next go up to Selections - Modify - Expand and set it at 13. Then select your paper and go to your arrow tool and click on your paper and delete your orignal paper layer. Open Tube and Copy it. Paste your new copy of your tube above your paper layer. Do, the same steps as we did above. Once you have that done. Select your tube and go up and go to Effects - Plugins -Xero - Radiance mess with your setting and set to your likes. Next, Effects - Plugins - Xero - Porcelain and set as you wish. Next, over in our layers area pull down to Luminance and 59 Opicity and this is still tube layer we are working on. That is it. 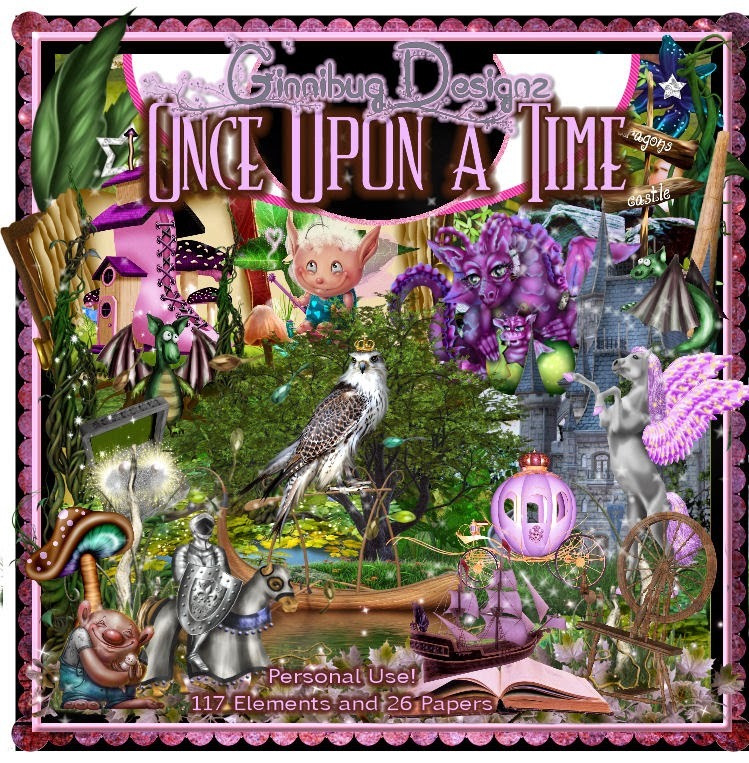 **New CT Tag** Scrap Kit of choice, I am using a PTU Scrapkit called *Summer Fantasy* By Pink Paradox Productions. Copy & Paste to canvas. Resize and Position to center. Copy & Paste to top layer. Resize & Position to right bottom corner of tube layer. Arrange your tube layer in the center of your work area. Copy& Paste to layer just above your tube. Resize & Position on left bottom side of tube and line it up with your Summer Fantasy (19) as I have done. Copy & Paste to top layer. Resize & Position to left bottom and blend it in with Summer Fantasy (23). Copy & Paste to layer just above Summer Fantasy (19). Resize & Position to right bottom and blend it in with your Summer Fantasy (19). Copy & Paste to layer just above Summer Fantasy (22). Resize & Position to the from of your Summer Fantasy (22). Copy & Paste to top layer. Resize & Position to right side and rotate as I have done and blend it in with your other elements. Copy & Paste to layer just below tube layer. Resize & Position to fit behind your tube as you wish. (Duplicate x4). Copy & Paste to bottom layer. Resize & Position to right upper corner. (Duplicate) then press ctrl+B to add on other side of your work. Copy & Paste to layer just above Summer Fantasy (89). Resize & Position to right center and blend flowers in behind paint brushes. (Duplicate) then press ctrl+B to add to other side. Copy & Paste to layer just above Summer Fantasy (122). 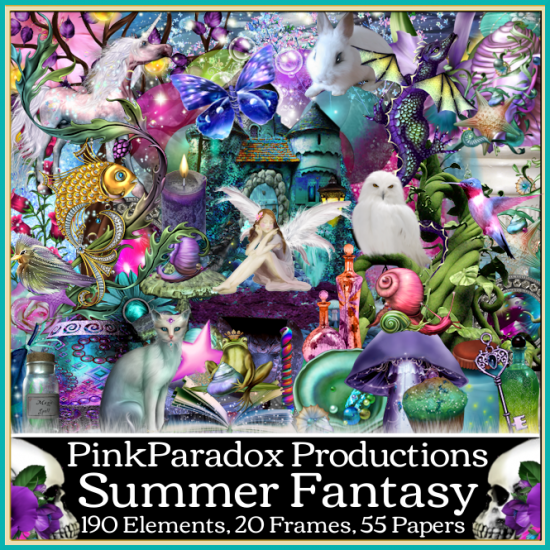 Resize & Position to fit in and blend with Summer Fantasy (122). (Duplicate) then press ctrl+B to add to other side. Make sure that your copy is on top of Summer Fantasy (122). Copy & Paste to top layer. Resize & Position the bottom center and blend it in as you wish. Copy& Paste to layer just above tube. Resize & Position to lower center just in front of tube and adjust and blend it in. Copy & Paste to top layer. Resize & Position to look as if it is sitting on your Summer Fantasy (90) element. Copy & Paste to top layer. Resize & Position to the left center and blend in as you like. (Duplicate) then press ctrl+B to add to other side. This tutorial was written by me on March 16th, 2015. Any resemblance to any other tutorials is purely coincidental! You may not copy/paste any part of my tuts elsewhere, but you may text link to them for challenges etc! 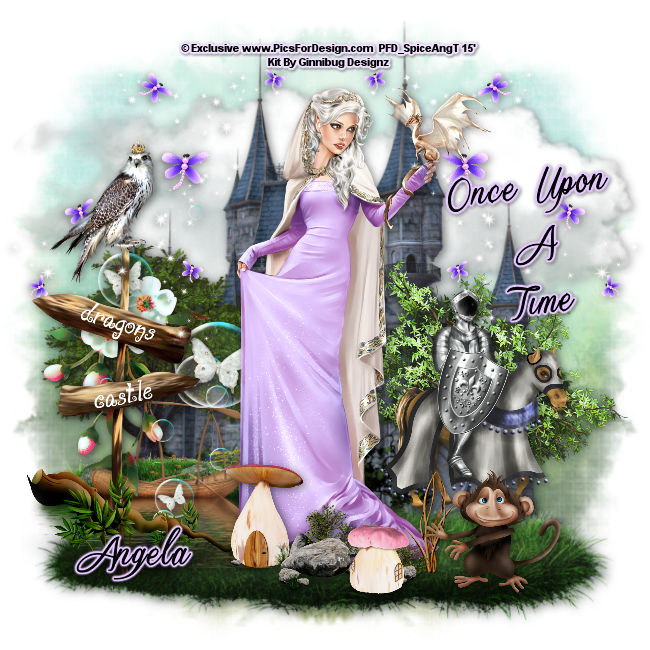 **New CT Tag** Scrap Kit of choice, I am using a PTU Scrapkit called *Earth Spirits* By Pink Paradox Productions. Copy & Paste to bottom layer. Resize & Position to fit center behind your tube. Copy& Paste to bottom layer. Resize & Position to fit under your Frame (6) as I have done. Copy & Paste to layer just above frame (14). Resize & Position to left center of of your tube. (Duplicate) then press ctrl+B and move to your liking. 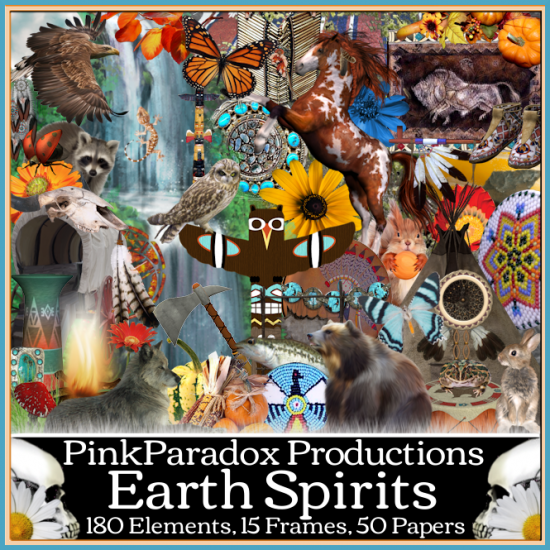 Copy & Paster to layer just above Earth Spirits (141). Resize & Position to left side and center on your frames. (Duplicate) then press ctrl+B to add to other side. Copy & Paste to layer Just above Earth Spirits (180). Resize & Position to left side and center on your frames. (Duplicate) then press ctrl+B to add to other side to match. Copy & Paste to layer just above Earth Spirits (181). Resize & Position to top center and then press ctrl+I. Copy& Paste to layer just above Earth Spirits Frames (12). Resize & Position to lower right side just behind tube layer as I have done. Copy & Paste to layer just below tube. Resize & Position to left bottom corner just next to tube and press ctrl+M and arrange as I have done. Copy & Paste to layer just below Earth Spirits (87). Resize & Position to bottom left corner. Then you will need to press ctrl+M and move as you like behind the wagon. Copy & Paste to layer just above tube. Resize & Position to fit in front of tube and center it as I have done. Copy & Paste to top layer. Resize & Position the bottom center of the pond. Copy& Paste to top layer. Resize & Position to lower right corner off to right of teapee. Copy & Paste to top layer. Resize & Position to right center and add as you wish or as I have done. Copy & Paste to top layer. Resize & Position to left side and add where you with or as I have done. Copy & Paste to top layer. Resize & Position to look as if it is going to land on bears nose. Copy & Paste to top layer. Resize & Position to right upper corner. (Duplicate) then resize to make a little smaller then press ctrl+M. This tutorial was written by SpiceAng on March 16th, 2015. Any resemblance to any other tutorials is purely coincidental! You may not copy/paste any part of my tuts elsewhere, but you may text link to them for challenges etc! Becky, comes with three hair colors. This gorgeous PTU Tube can be purchased here and here. 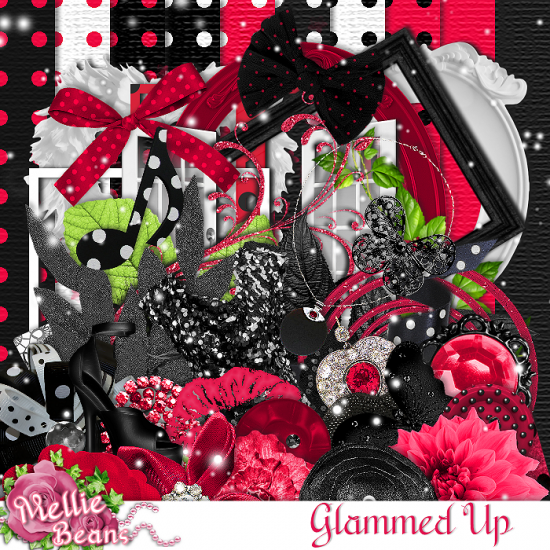 Scrap Kit of choice, I am using a PTU Exclusive Scrapkit called *Cowgirl* By Mellie Beans. Cowgirl is a kit match for "Becky", a tube by SpazzArt. This tagger sized Country/Western themed kit would also be a perfect match for "Rope Em" tube as well! You can purchase her amazing kit here. Copy & Paste to your canvas. Resize & Position to the center of your work area. Cope & Paste to top layer. Resize and Position to the bottom center of your e42. Copy & Paste to layer just below e03. Resize & Position to the center of your e42 and e03. Then flip by pressing ctrl+M. Then you will need to select your eraser tool and erase the tube that is under your e03. Copy & Paste to layer just below your tube. Resize & Position to bottom left side and rotate. Copy & Paste to layer just above e26. Resize & Position to the left side on the edge of e26 as I have done. Copy & Paste to layer just above e42. Resize & Position to the left side behind your other elements and place as you wish. Copy & Paste to layer just above e26. Resize & Position to the left side and add just below e24. Copy & Paste to layer just above e42. Resize & Position to center lower bottom of tube and e42. Copy & Paste to layer just above tube.Resize & Position to center bottom of your work as I have done or as you wish. Copy & Paste to layer just above tube. Resize & Position off to the right side of your tube or to your taste. Copy & Paste to layer just above e34. Resize & Position to just above your bucket and (Duplicate) then flip by pressing ctrl+M. Then select your eraser tool and erase your bottoms of each so it looks like they are in the bucket. Copy & Paste to layer just below e03. Resize & Position to center of bucket element as I have done. Copy & Paste to top layer. Resize & Position to the left center of e42. Copy & Paste to layer just below e17. Resize & Position to left bottom side and blend in with the other elements as I have done. Copy & Paste to very bottom layer. Resize & Position to center of e42. Copy & Paste to layer just above e38. Resize & Position to top center of your e42 and tube. This tutorial was written by me on March 15th, 2015. Any resemblance to any other tutorials is purely coincidental! You may not copy/paste any part of my tuts elsewhere, but you may text link to them for challenges etc! 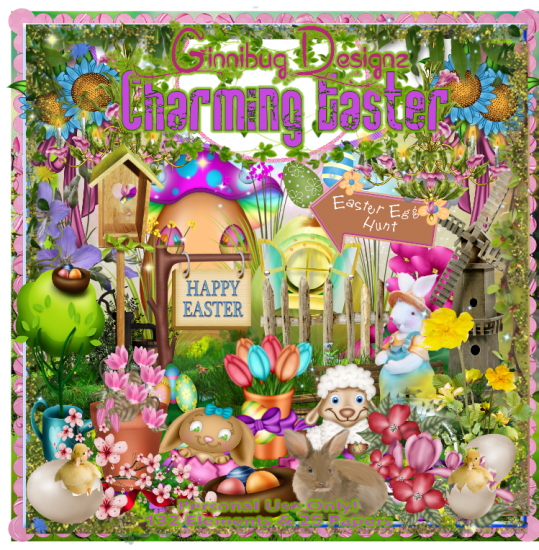 Easter themed tagger sized kit with 72 elements and 12 papers. This kit would be perfect also with other themes such as Spring, outdoors and gardening! Tube or Image of choice, I am using a PTU Tube *Kaily* By ©Alex_Prihodko can be found here. Copy &Paste to canvas. Resize & Position center of your canvas. Copy & Paste to top layer. Resize & Position to bottom left corner. Copy & Paste to top layer. Resize & Position to fit as if they are in the nest with eggs. Copy & Paste to layer just above frame. Resize & Position to bottom right of frame and then duplicate. Then press ctrl+B to mirror image. Copy & Paste to layer just above both Flowers 2. Resize & Position to center of the frame and Flowers 2. Copy & Paste to top layer. Resize & Position to right side bottom and flip by pressing ctrl+M. Copy & Paste to to layer. Resize & Position to fit right in front of nest of eggs. Copy & Paste to layer just below Easter Eggs. Resize & Position right behind Easter Eggs and rotate as I did if you wish. Copy & Paste to layer just above frame. Resize & Position to left side on frame element and place as you wish. (Duplicate) and press ctrl+B to add to other side of frame. Copy & Paste to layer just above Flower Stem. Resize & Position to left side on Flower Stem and place to your liking. (Duplicate) then press crtl+B to add to other side. Then go back to left side and select Flowers 1 and (Duplicate). Then we are going to press ctrl+M and resize and move down and rotate. After you have where your like then (Duplicate) and press ctrl+B. Copy & Paste to layer just above frame layer. Resize & Position center top of frame. Copy & Paste to layer just below bunny. Resize & Position to right side behind bunny and position to your liking. (Duplicate) and press ctrl+B and move that layer up in front of nest of eggs. Copy & Paste to bottom layer. Resize & Position to fit inside frame on bottom. Copy & Paste to bottom of frame. Resize to fit inside frame. Go up to Effects at top. Pull down and go to Texture Effects then over to Weave. In Weave we are going to go with these settings. make sure black is your color for both. Then you should have a check mark in the box fill gaps. Copy & Paste to your work and add as you wish.